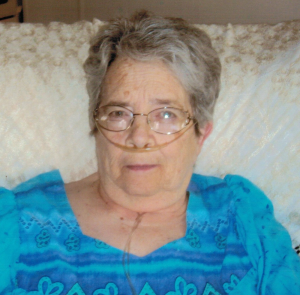 RUSSELL – Mary E. Colton, age 79, of Russell, passed away at home on February 20, 2018 under the care of her family and hospice. Calling hours will be held at French Funeral Home in Edwards on Sunday, February 25, 2018 from 2:00 – 5:00 p.m. Her funeral service will be on Monday at the funeral home at 1:00 p.m. Burial will follow in the Pleasant View Cemetery in Clare. Mary was born on September 25, 1938 in Russell to the late Harold Merle and Laura (McKee) Towne. She attended the Knox Memorial High School and married Wesley J. Colton on September 25, 1954 at the Edwards Methodist parsonage. Mary has lived in Russell her entire life. She enjoyed working on crossword puzzles, reading, and playing Bingo. Mary loved spending time with her family, especially her grandchildren and great-grandchildren. Her survivors include her husband, Wesley; 2 daughters, Laura Burnett and her husband, David, Dawn Feigel; and 7 sons, Randy and his wife, Karen, Rocky and his wife, Alita, Ricky and his wife, Debbie, Kelly and his wife, Judy, Eric and his wife, Frances Jane, Kerry and his wife, Susan, and David Colton. She is also survived by 2 brothers, Willis Towne and Frank Towne and his companion, Marge; and 24 grandchildren, 31 great-grandchildren, and many nieces and nephews. Mary is predeceased by her parents and her sister, Margaret Jackson. Donations in memory of Mary may be made to the American Heart Association, PO Box 3049, Syracuse NY 13220. Condolences may be shared online at www.frenchfuneralhomes.com.